Does God’s presence seem distant? Do you have a friend who has grown numb to the things of God? Have you given up on hearing God’s voice in the way so many authors and preachers talk about? Are you ready to awaken your life to a vibrant, one-on-one relationship with the Father once and for all? This is your moment. Do we allow potential embarrassments to keep us from loving and worshiping God extravagantly? Section 1: What in the World is Worship? Chapter 5: God’s Presence – What Is It? Section 2: Why Worship, Anyway? Section 3: Who Again Are We Worshiping? Section 4: How Do We Do This Worship Thing? 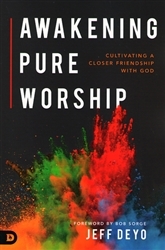 Jeff wonderfully guides the reader on a relaxed and personal journey into a greater understanding of this beautiful thing we call worship. A bridge builder by nature, Jeff invites us to cross over into new ways to look at and experience a life of worship. You’ll feel like you’re sitting right there next to him as he unveils one magnificent nugget after another. 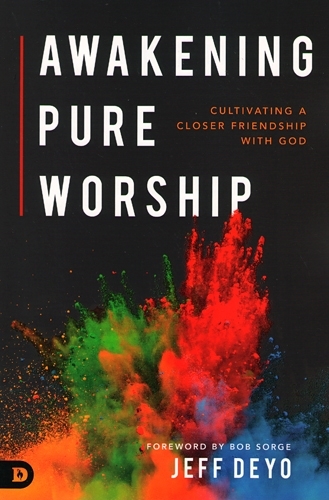 I highly recommend his book for everyone, from the casual singer to the die-hard worshipper. Awakening Pure Worship is a delight! We have ten thousand worship leaders but few worship fathers. Jeff carries the heart of a true father and shepherd that will jump off these pages as he speaks honestly to worshipers, worship leaders, and worship musicians. Thank you, Jeff Deyo, for leading us so well. Jeff Deyo is a worship leader, songwriter, author, blogger, speaker, and professor. He is the founder of Worship City Ministries and is internationally known as the former lead singer of the Grammy-nominated, Dove Award-winning worship band Sonicflood. He is one of the worship pastors at Celebration Church and holds the high honor of being a full-time faculty member at North Central University in Minneapolis, MN. He has been happily married to his college sweetheart, Martha, since 1992 and has four beautiful children, Roman, Evan, Channing, and Clara.